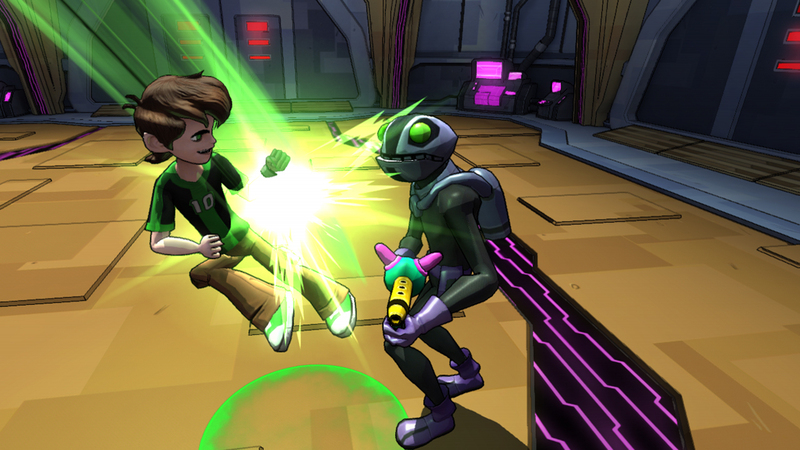 It doesn’t seem odd that we’d get a sequel to last year’s Ben 10 Omniverse game, but it does seem odd that a direct sequel would be created by a different developer. On top of that, the gameplay is entirely different, which is sure to cause some youngsters a bit of confusion. It’s also odd to have game focused on a two episode story arc and feature very few familiar characters. This is a very odd game, and not good enough to overcome that oddness. 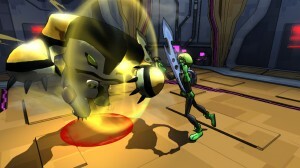 Omniverse 2 takes place during a story arc of the TV show where Ben is shipped off planet and Earth is conquered by an amphibian-like alien species called Incurseans. The game’s story follows Ben as he makes his way back to Earth to tip the scales back into humanity’s favor. There’s not much to it besides that basic description. There are seven “episodes” in the game. The first two follow Ben as he messes around on an alien ship, the next two involves hunting down equipment to get on a completely different ship, and the third set details Ben sabotaging said other ship. The final mission is a boss fight to sort of end things on a big note. Each episodes has a few lines of dialogue, but most of it is Azmuth trying desperately to get Ben to be serious about his mission. For more than half of the game, Ben and Azmuth are the only characters you see, unless you want to count the aliens that Ben can transform to. The enemies you see are generic baddies that don’t even spout off one-liners. There’s just no personality here. There are two modes to the game. The main mode is the campaign, which will take all but the worst of gamers about two to three hours to work through. After that, you can replay the story in a kind of new game plus mode, but there’s no indication beforehand that you’ll be doing it. It just kind of happens. 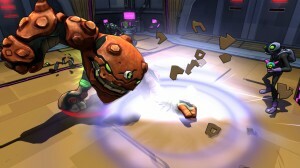 The other modes is an arena where you’ll team up with Rook (his only appearance in the game) to battle waves of enemies. A second player can control Rook, which is the only time co-op is available. There’s a general lack of modes here, and the amount of playable content is shockingly low. If you decide to play through the campaign and all of the arena missions, you might get about five hours of game time before you’ve run out of things to do. That’s just sad. Visually, you can tell the PS3 isn’t this game’s primary console. It looks like a low end PS2 game, to be honest. The environments are repetitive, blocky, and boring to look at. Character models are a bit fuzzy, and animations are stiff. 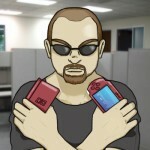 Honestly, I’ve played better looking games on the PSP. I swear. Poorer developers must have a backlog of generic sci-fi music somewhere, because the tunes in this game sounded eerily familiar to just about every other space game I’ve played. The tracks were tinny and generic, but were OK enough as background music. For voices, the game features a decent amount of solid work. The catch is that the writing is hokey and you’ll quickly grow tired of the one-liners. If I never hear Four Arms say “There’s four more where that came from!” again, it will be too soon. 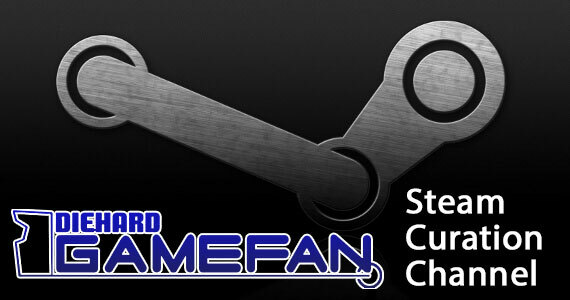 It’s not an impressive sounding game to be sure. 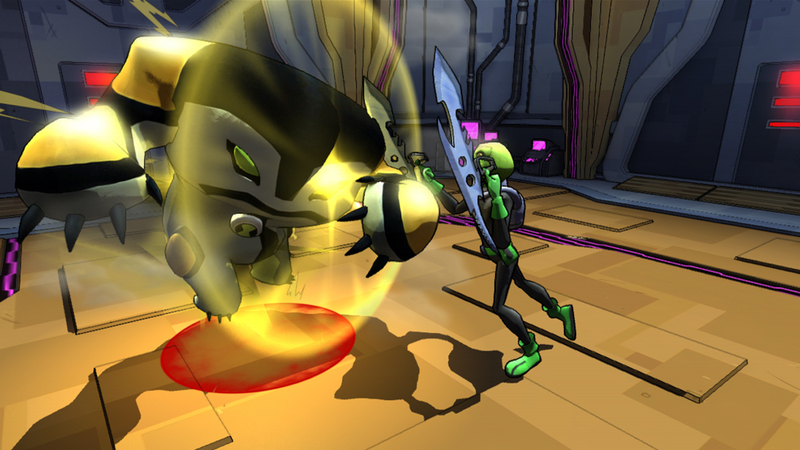 Omniverse 2 is broken up into two different gameplay types: running and fighting. Basically, you’ll start off at a hub. From there you can save and/or change out which aliens you have equipped. There are several aliens in the game broken down into three types. There are light, medium, and heavy aliens. You can take one of each. Each specific alien has his own move set, and can be upgraded by finding special emblems through the level. Once you’re ready to leave the hub, you simply run out the door and into the running section. Then you’ll run until you stumble across a combat section. Then it’s off for more running until the next combat area. You get the idea. For running sections, you only need to steer yourself between three lanes. The goal is to collect green orbs that fill up your health meter while avoiding obstacles that can drain it. When you reach the end of a hall, you’ll have to decide which way to turn. There will be markers to show you which ways you can go, and special markers alert you to the presence of an extra you can grab. During these sections, you’ll pretty much always be an alien, and you’ll need to switch between the three different types to utilize their various abilities. 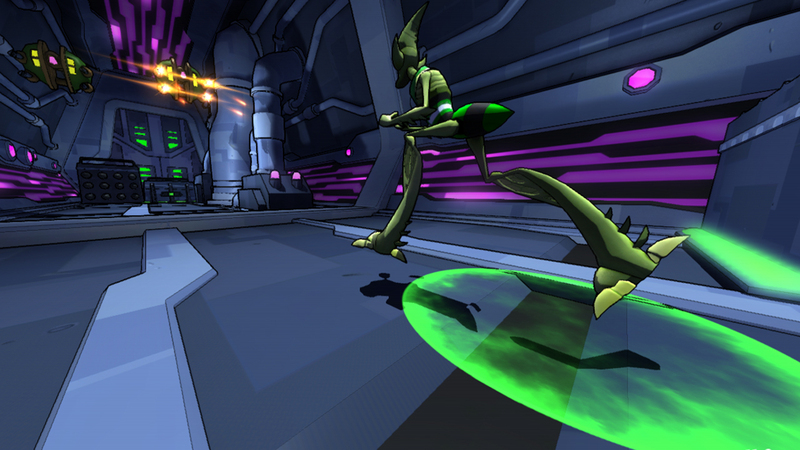 Light aliens can jump over hurdles, leap over gaps, and move very quickly in general. Heavy aliens are slow, but can break down walls and activate pressure pads. 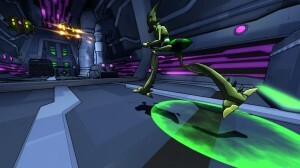 Medium aliens have balanced speed and the ability to fire projectiles. All of these abilities activate automatically, so your only job is to switch to the right alien for the job. If you run out of health, you’ll switch to Ben until a meter recharges or you find some orbs. Ben has no abilities whatsoever, so you have to hope you don’t run into anything. If you get hit as Ben, you go back to the hub. The closest things get to interesting in these sections is when you’ll have to chase down an enemy. For these sections, you’ll need to catch up using the light alien. 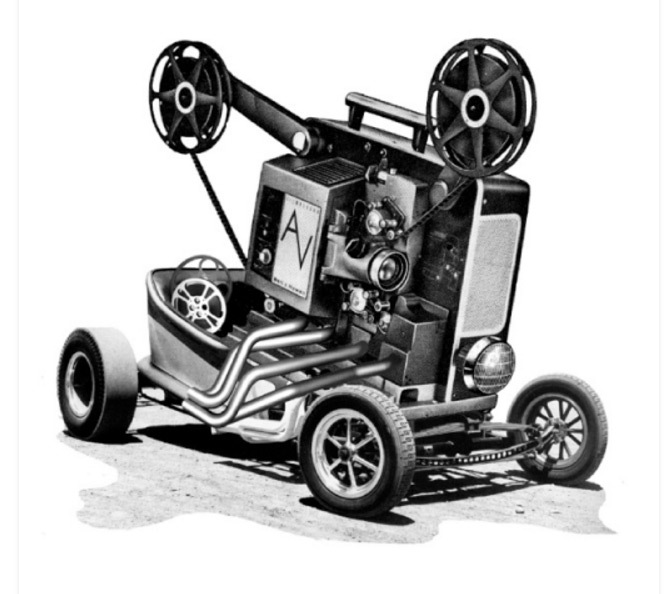 When you get close, you’ll have to switch to the medium class so that you can blast away. Not to mention, there will still be obstacles in your way, so you’ll need to juggle a few balls in the air in order to succeed. 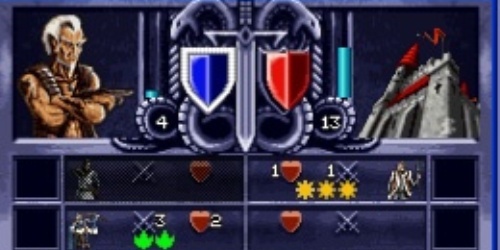 For battle sections, the game switches to a conventional setup. You have a light attack, heavy attack, a defensive move, and a jump. Once again, you can switch between alien types in order to take advantage or their differences. Smaller aliens are more agile, medium aliens fire projectiles, and heavy aliens are like tanks. Again, if you run out of health, you’ll switch to Ben. Take even one hit, and you go back to the hub. The nifty thing here is that each alien is actually different and feels unique to play as. While Bullfrag and Four Arms are both heavies, they play differently. Bullfrag can use his long tongue to grapple onto a far away enemy. This both gets you in close and stuns them. His attacks are faster, but can only hit one enemy at a time. Four Arms, on the other hand, is pure muscle. He can throw up his arms to block attacks while he runs toward an enemy, and his attacks have a much wider range. The nifty thing is that the combos are the same for each character, so you won’t have to learn a new set for each one. The downside to that is that you’ll likely end up performing the same three button combo repeatedly throughout the whole game. There are various enemies in the game, and the short length prevents any one enemy from becoming overused. Basically, there are melee enemies, gun-toting enemies, and medium range enemies. Melee types will charge toward you with reckless abandon. Ranged fighters will happily sit back and take pot shots. Medium range enemies use specialized weapons. There are frogs with flamethrowers, and frogs that can freeze you in place. You’ll often fight several different types of enemies at once, with new ones spawning to take the place of their fallen comrades. There will also be turrets, just in case you didn’t have enough to deal with. It seems like it could be a fairly decent setup, but it isn’t. The running sections get old quickly, and you’ll often run the same halls dozens of times as you unlock new paths or have to restart. During battle, the enemies are relentless, and taking a single hit puts you in trouble of getting caught in a chain of attacks. Often, I found myself unable to perform any action for several seconds as they each took turns knocking me to the ground the instant I stood up. However, it’s not a hard game at all. The stronger enemies are usually easy to avoid while you mop up the more annoying smaller ones. Those smaller ones can only take a hit or two from your heavy aliens, so they don’t pose much of a problem once you get in close. You’ll also discover that certain aliens are simply more useful, as there are ones that have a wider range of effect. Cannonbolt is basically unstoppable. The best thing I can say about this game is that it’s playable, and will surely please at least some people. 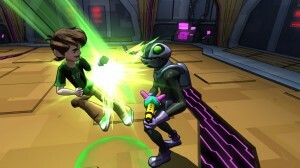 However, those some people are going to need to be massive Ben 10 fans that aren’t sick of the games already and willing to slog through a mindless adventure. I suppose trophy hunters might “enjoy” it as well, as it isn’t very hard to platinum. However, I can’t say I would recommend this game. There just isn’t much going on, and it feels like a low rent iOS game rather than a proper retail PS3 title. 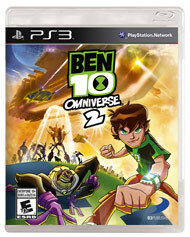 Ben 10 Omniverse 2 is a mostly functional action game that attempts to mix things up by combining running sections with generic brawler combat. However, the incredibly short length, lack of compelling content, and boring mechanics make it a hard game to recommend. I suppose a big enough fan of the show might enjoy it, but everyone else should stay clear. At the very least, there’s no way this game is worth forty bucks. Wait until it drops down to ten at most.